will never be rented, traded or sold. Directly In Your Brain,	FAST AND EASY. "Can't believe we are bombarded by so many external messages from the media TV, Radio, etc. that we unconsciously accept, and do nothing to put some good positive thinking to better ourselves. Great idea, Great Software, carry on!" If you are like me you are always striving to achieve the best things in life. Have you ever wondered "How can I be successful at all the things I do?". Have you ever thought "I would like to achieve my goal, but it's just too hard!". I'm sure many times you wondered how do successful people get their motivation, confidence, personality and skills to accomplish almost anything they intend to do. Sometimes it seems that our own mind works against us.. and YES you are right! Let me tell you it's true! Our own brain is limiting us to achieve the full extent of our capabilities! What if I told you there is a simple and automatic way to open your mind, let it learn, let it bond to your body and improve your performance, on virtually anything you try, call it business, social life, health, sports, learning.. you name it! Do you want to stop smoking? Do you want to learn faster? or maybe always be motivated with an excellent mood every day! You can do it today, fast and easy and I'll show you how. Subliminal therapy is not a new thing. It was started back in the early 1900's. One of the first methods of subliminal suggestion used was called whisper therapy, in which a patient was whispered suggestions in hopes of subconsciously induce him/her for behavior improvement. As technology has increased subliminal messages have been included in many forms of media including images, music and sound. Subliminal messages have been used by governments and companies to influence individuals. On an Experiment done by Radboud University's Department of Social Psychology (Netherlands), subjects where exposed to subliminal messages of a specific brand of beverage (Lipton Ice Tea) for 1/45 of a second during a series of tests on a computer. The statistics showed a dramatic increase of 69% in choosing the subliminally induced brand for the subjects exposed to the messages, over the control group (subjects not exposed). A suggestion to the person at a level inaudible or invisible to the conscious mind will be entered directly into the subconscious mind. The subconscious mind accepts commands without questioning them. It's like a child. Have you seen how fast a child picks up languages or for example learns to use computers? At an early age the mind doesn't filter and limit new thoughts. As we grow older we imprint do's and don'ts at a conscious level. We block and question new thoughts. Our subconscious is exposed since we are in our mothers belly! YES even then we receive suggestions and our brain makes them ours and interprets them once we understand words at a very young age. We are very vulnerable also when in times of pain (physical or emotional), distress, unconsciousness (externally induced: e.g. under anesthesia; Or self induced: e.g. while in sleep). It is then when bad commands can get through easily to our brain. While we are fully aware, commands are reasoned and filtered. In order to influence in a positive way we need to deliver good, favorable commands in an unnoticeable and repetitive way. UK researchers report the brain does register subliminal images even if a person is unaware they have seen them. Using brain scans, a team from University College, London, showed people registered "Invisible" images showed to them using visual subliminal techniques. "If there is 'spare capacity', in terms of attention, the brain will allocate that resource to subliminal activity". By use of the Affirmation Delivering Engine, MindZoom conveys thousands of positive commands at speeds that are bypassed by your conscious mind. These messages are flashed rapidly on your screen at virtually undetectable speeds, SAFELY AND DISCRETELY. By use of our Silent Subliminal Messaging System, text affirmations are converted to speech and delivered through a Subliminal Frequency envelope, not heard consciously by the human ear but reaching the brain. 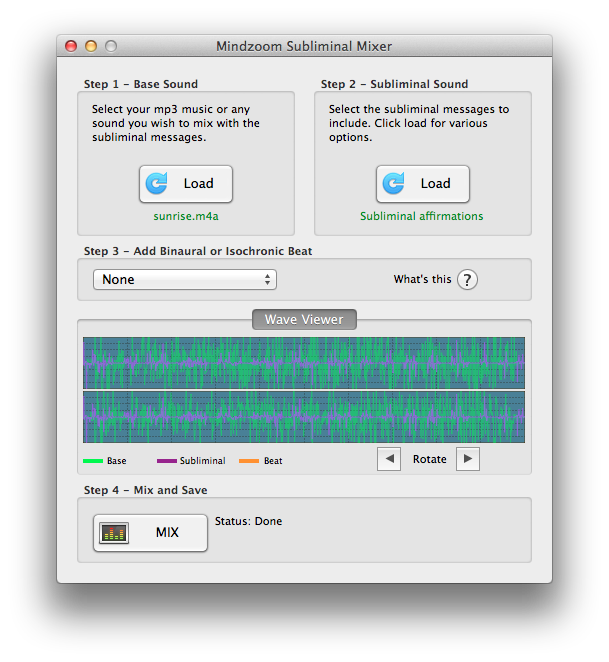 By use of the Mindzoom Subliminal Mixer, a great feature where you can use text or audio affirmations (you can record your own affirmations or use pre-recorded ones) and Mix them with your favorite music files, save and listen to them anywhere, on your Ipod, home or car stereo, you name it! Minimize MindZoom and it's placed on your Taskbar and works seamlessly increasing your mental capacity and brain use, while you spend your time doing other things like working or surfing the web! QUICK FAQ: Can I configure my own affirmations? A: YES! I'll show you how, read on! I work constantly on my computer, I've set my affirmation speed and receiving over 18000 affirmations a day. WOW! I'm recommending mindzoom to everyone. Thanks again. This software is life changing! Anyone can use it. It's easy! After you install MindZoom just click the icon to open it and it's ready to work. You will receive a full online manual, but probably won't need it being the configuration so intuitive. 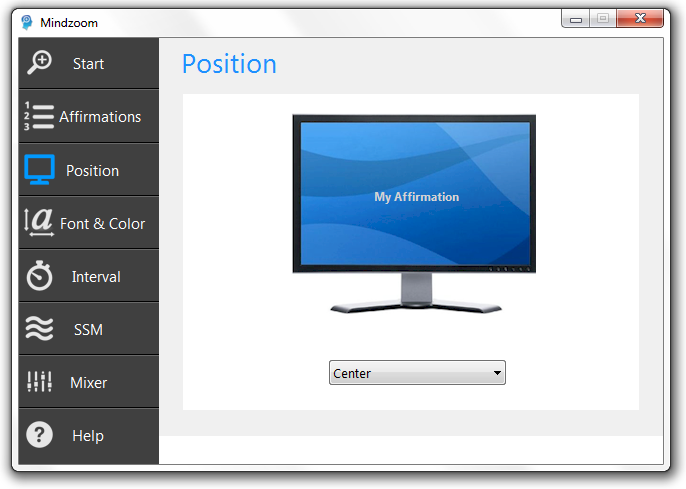 Select the affirmation files you wish to display, easily configure your settings and hit Start!. That's it. Thousands of positive affirmations zooming into your mind. Want to create your Own affirmations? No problem! Add, Change or Delete your affirmations. Select the affirmations you want displayed and subliminally sent. Select the display position. After user trials and suggestions these are the common and useful places to display your affirmations. It includes several fixed placements and also a random placement option. 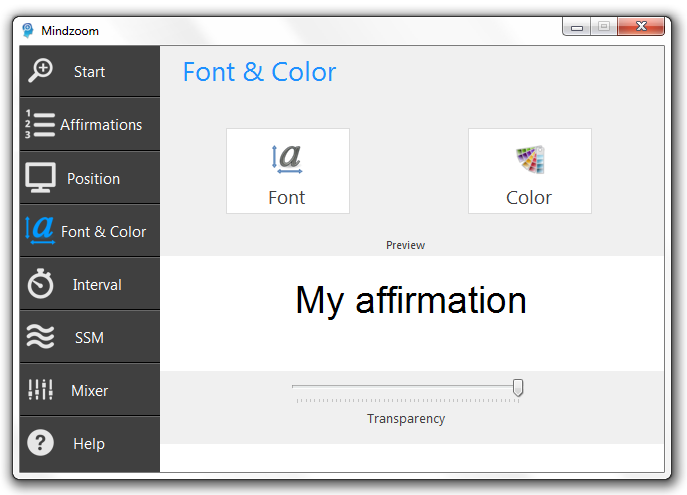 Change your font preferences Easily set the font, size and color of the affirmations to be displayed. Maybe you want a smaller font to have affirmations discretely displayed. You can set a level of transparency and maybe you want a color that will contrast better with your PC background.. It's up to you! Message interval and display duration. You can set a frequency between 20 seconds (180 affirmations per hour) up to 1 second (3600 affirmations per hour!). And a display time from half a second to 10 milliseconds (almost invisible). Once again it depends on what suits your needs. Silent Subliminal Messaging. This is what makes MindZoom so unique. MindZoom will translate your affirmations from Text to Speech and deliver them through a subliminal frequency sound wave. Are you serious? YES! "Silent Sound" will be channeled through you PC speaker. You can use the Silent Subliminal Tests to make sure the Text-To-Speech synthesis is working properly and that the HF envelope runs OK.
Other settings. Tell MindZoom to start automatically on every Startup. It is automatically placed on the system tray and affirmations will blaze your way. 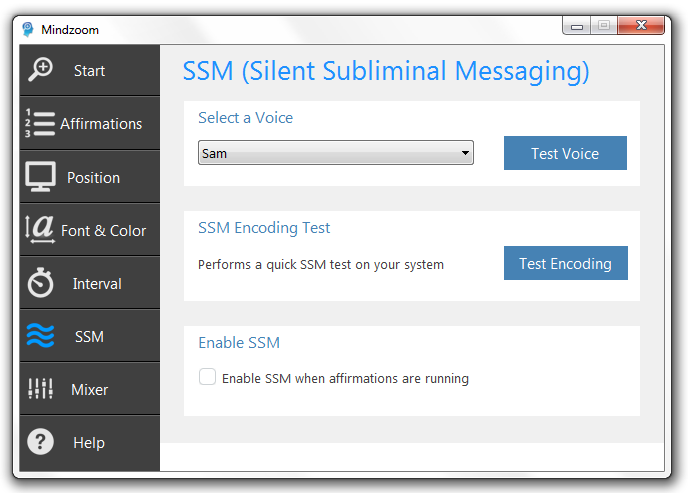 Also you can enable or disable the Silent Subliminal Messaging feature. Remember to save your current settings. Click and save your settings for the next time you use MindZoom. If you want to go back to the Default Settings, just click on "Reset Defaults" and again on "Save Settings" to keep them. Once running, minimize the window and MindZoom will place itself out of your way in the System Tray. Right-click to access quickly to MindZoom's options. You can continue working with your PC, no problem! Affirmations will be displayed on top of any open window, and also played Silently through your PC speaker, you can listen to music if you want, it will not interfere with the Affirmations sent directly to your subconscious. 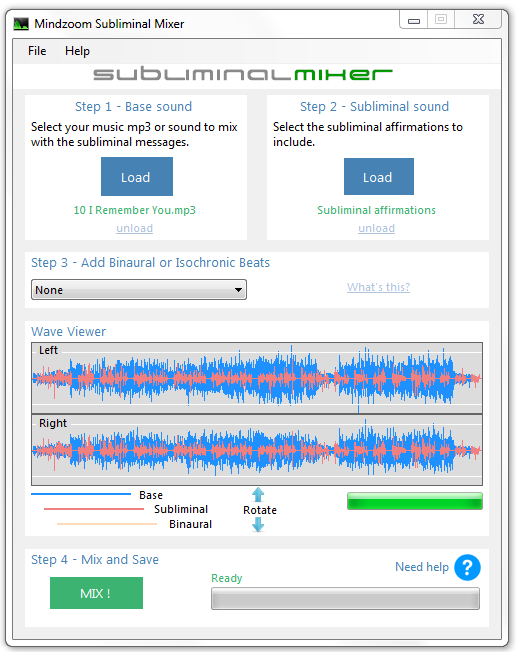 Mix any sound or music file with your subliminal affirmations. Select the base sound (music, sounds of nature, etc), select the affirmations, Mix and Save, that's it! 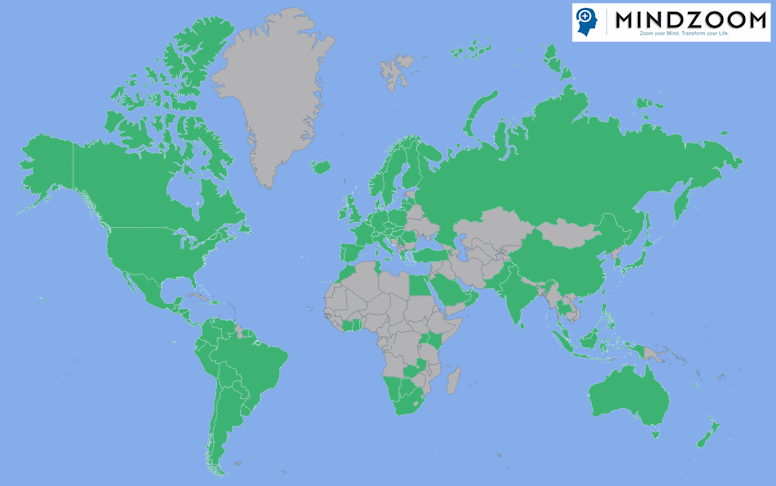 Most popular formats supported to load and save the mixed files (Windows: .wav or .mp3; MacOS: .wav, .aiff, .m4a). With .wav you can burn your audio CDs and with MP3 or M4A you can take them on your portable devices! Don't want to listen to background music? No problem, you can select the "Generate a Silent Base Sound" option, and the audio file will contain your affirmations and be Silent. Record your affirmations with your own voice or write them down and let the digital voice speak them out. Select the affirmations you want to use for the mix. 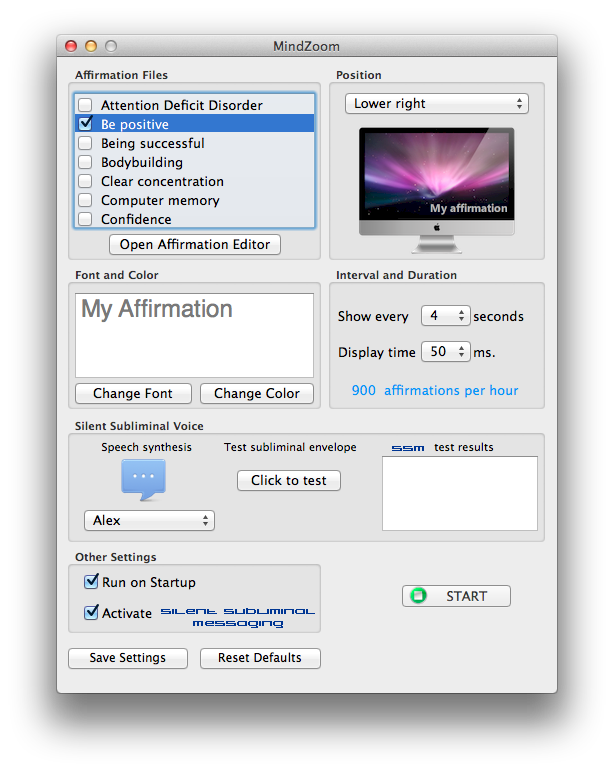 You can use the preloaded text affirmations (add,edit or delete them); Record your own affirmations or load a previously recorded file. Add binaural or Isochronic beats. Use this feature to include a Binaural or Isochronic beats and tones and improve your brain's receptiveness to the messages. Silent Subliminal Mixing. The MindZoom Mixer uses the Silent Subliminal technique to embed your affirmations inside the main sound. Automatic audio length matching. It doesn't matter if the time length of the affirmations is smaller than the main sound. The mixer will take care of it. It will loop the affirmations until the end of the main sound. In other mixing packages you have to do this manually, the Mindzoom Mixer does it for you. Sound Quality For best quality the mixer will save using 44.1 Khz, 16 bit sampling (Audio CD Quality). Notice resulting audio files (specially if saved as .wav) may take a lot of disk space. Introduce success in your life! Perhaps you like to learn something new? I love to try new things! But sometimes the difficulty overwhelms me. No problem, I set up a group of affirmations that will attack a certain goal and maintain these running for about 2-3 weeks, eventually barriers in my mind fall down, learning and achieving becomes easier each and every day. Let me tell you: "I'm not only the MindZoom Software creator, I am also a customer" - ok, stole that one from a famous hair clinic, but TRUE :) - I wouldn't promote something I don't believe in, so first test subject: ME. Being a tennis player I had a pretty simple goal: to improve my game. I had been training 3 times a week (I was part of my university's team) but I felt stuck, like something was missing in order to ramp up my game. After 3 weeks of using my -prototype- program, my friends who normally used to beat me, could not keep up! And later that year I reached the tournament final. I knew this thing was for real! I then understood the problem wasn't my arms and legs, but the barriers in my mind. 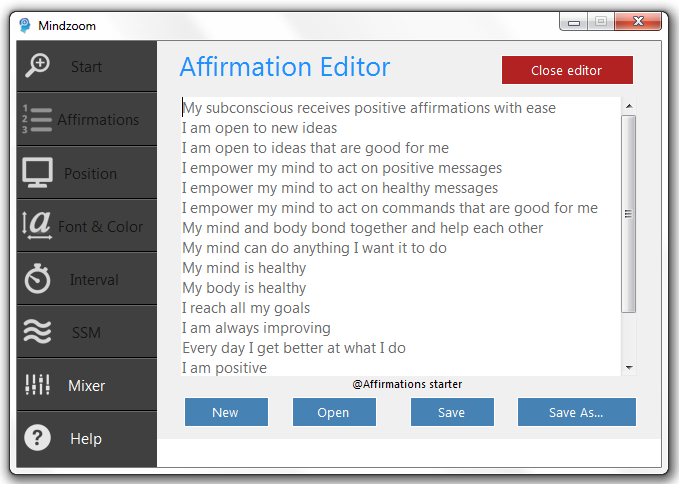 With that experience and great feedback from many users the software includes a help section where you can find a guide on how to write your own affirmations and a proposed goal achieving plan. Remove bad habits. From the root out, and the root is inside your Mind! Quit smoking, Stop over eating, Stop drinking, etc. Computer memory. Recall events, faces, names, numbers without effort, just ask for data to your brain and it will be served to you. Improve your social skills. Don't like speaking in public? Would you like to be a natural leader? or Maybe get along better with people . 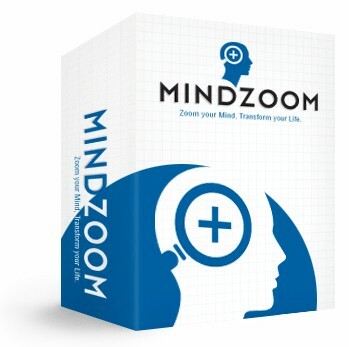 MindZoom can Blast away those mind blockers that don't let you unfold your true personality. Enhance your aptitudes, physical abilities, Sports! Just like practice develops and reinforces the Mind-Body bond, MindZoom's subliminal affirmations can command your brain to a "You can do it" state, liberating the obstacles your own mind sets, and improving that Mind-Body link. Understand your feelings. Get in touch with your sensibility, learn to act positively under distressing situations, resolve your personal issues and benefit from learning from your mistakes. Multiply your business achievements. Be creative on new business ideas, let your mind be wise on decisions, attract wealth first by setting your mind on winner mode. SIMPLY BE HAPPY. That is the ultimate goal for us all. Let's achieve total PEACE and HAPPINESS. And so much more.. the possibilities are endless! SO MUCH BETTER THAN: Hypnosis, Meditation, Expensive Therapy. No Need to Dedicate "Extra Time"
3600 Affirmations Entering Your Mind Every Hour! With this new technology there are no excuses. No need to spend $$money on Therapy, or many hours in Hypnosis sessions. It is pretty straight forward, while working in your computer MindZoom sends imperceptible visual and audible messages directly to your subconscious. All you need is a computer. If you EVER have a question, I'm posting here my personal email address, simply email me and I will get back to you quickly. I am here to help you succeed, to help you make improvements FAST. To make everything simpler for you, The help section of the software will walk you step by step through the several features, explaining each one in detail. I Also include a guide on how to write effective affirmations and a proposed plan on how to maximize their efficacy through the software. I will show you how to accomplish the same results I had and thousands of people are having with MindZoom. MindZoom Software, that blazes up to 3600 affirmations per hour. If you use your computer only 2 hours a day you get 50400 affirmations a week, that's 216000 affirmations per month! Silent Subliminal Messaging. Included in the software, this is a very powerful proprietary technology, that will complement the visual affirmations. Each and every affirmation you select to display will be synthesized by a Text-To-Speech engine, and sent to your brain Silently in a Subliminal Frequency wave through your PC speaker. Only found in MindZoom. Mindzoom Subliminal Mixer. FOR A LIMITED TIME ONLY it comes included at no additional cost. Mix and save your affirmations with your favorite music or audio files. In the near future I'm planning to offer the mixer separately at a higher cost, but for now I decided to include it free of charge. Complete help guide. Easy to follow instructions to setup and configure MindZoom. Most likely you won't need it, since it is so intuitive! Detailed plan to succeed. In my own experience and through numerable feedback, I have developed a plan to use MindZoom efficiently and meet my goals. I include it for free. Of course you can also come up with your own way to use MindZoom to your benefit. License to Run MindZoom on multiple computers. When you purchase MindZoom you will be granted to install it on up to 4 computers (as long as You are the main user). I'm thinking your home PC, your Laptop, Your PC at Work and one extra in case you have even another computer. This means you can use MindZoom anywhere you have a computer. Complete email support. Be it technical support, help on writing your affirmations, how to tweak Mindzoom, or if you simply want to chat about the weather.. I'll be there to respond any questions you have. All of this for a one time payment of only $67.00, no extra monthly fees. If you divide that over a 30 day period, that's only $2.23/day, less than half you'd spend on your daily coffee. MindZoom will turn you into a gifted person. Want more achieved? Start a new goal every 2-3 weeks. I've fine tuned the system for you, now you just have to use it. It's only $67.00 for now. I reserve the right to increase the price at any time, and I probably will soon. If you really think about it, MindZoom won't really cost you anything compared to the benefits of health, wellness and overall happiness. 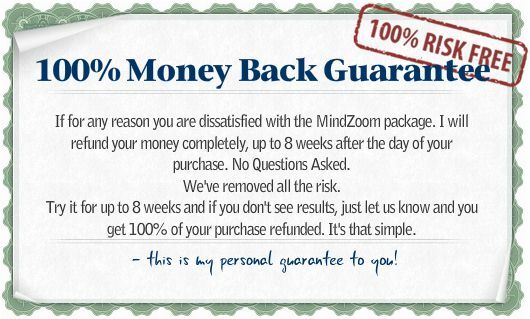 CLICK HERE to start enjoying the benefits of MindZoom! 40 minutes of subliminal audio designed to gently re-script certain subconscious limiting beliefs in order to open the way for beneficial positive personal change. You will find yourself drifting automatically into a relaxed state when the embedded subliminal suggestions can take effect with minimal resistance. The 4 Secrets of the Happiest, Wealthiest and Most Successful, derived from research by Stanford University. Now we’ve condensed these practices into a breakthrough technology that only takes 3 minutes a day..
Over 70 pages of deep knowledge about how your mind is the real creator of everything you see. Learn the Universal secrets that govern every area of life and reality. What is the construct of everything we see? Check it out, you will be surprised to know that a "Matrix" like world is not fictional but real! Relax and listen to these Meditation Audio Tracks, designed to bring you Abundance, Health and Happiness. Use 101 Powerful Affirmations to overcome fear; build your self-confidence; develop an abundance mind-set; achieve your ideal weight and body image; attract the right life partner; find inner peace, clarity and your life purpose; easily activate the law of attraction and bring everything you’ve always wanted into your life! A collection of 1150 professionally written Affirmations divided in 60 groups so you can get started quickly! Clear concentration Fast learning Musical Instruments Spiritual me Quit Alcohol And Many more.. Yes! Dino. I want to order MindZoom that includes the full configurable 3600 Affirmations per hour display engine, Silent Subliminal Messaging AND Subliminal Mixer. Yes! I understand that I will receive a License to run MindZoom in up to 4 different computers and Free minor Updates. Yes! I would like to receive the pre-loaded 1150 affirmations and accompanying bonuses!. As soon as your payment is authorized (this usually takes less than a minute), you will be given instructions on how to download your software , and the accompanying bonuses.